The NucleoCounter® NC-100™ is an image cytometer based on fluorescence from the fluorescent dye, propidium iodide (PI). The NC-100™ eliminates human subjectivity and can count even the most aggregated mammalian cells using the NucleoCassette™. 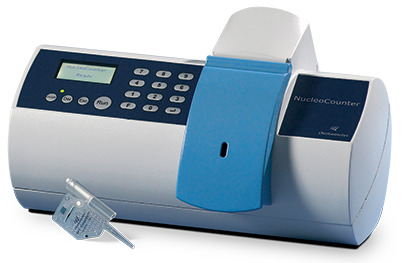 The NucleoCassette™ itself is calibrated and severely limits user interference making the NC-100™ very suitable for GMP. The NucleoCounter® NC-100™ concept offers determination of cell viability in addition to the total count of cells in the sample. Determination of viability is based on the “PI-exclusion” method. The cell viability of a sample is determined using the total cell count and the count of non-viable cells as shown below. 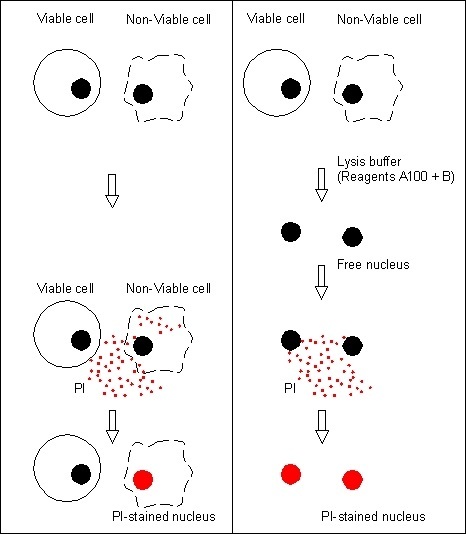 When a sample is mixed with Reagent A100 and Reagent B a lysis of the viable cell membrane takes place rendering all the cell nuclei susceptible to staining with propidium bromide (PI) resulting in a total cell count. Non viable cells however are permeable without treatment and are therefore stained directly with PI, resulting in a non-viable count.